It takes courage for 52-year-old Sumana Dissanayake to face a single day – sometimes just a couple of tiny lake fish caught from the Parakrama Samudra are all that keep her family from destitution.�Mrs Dissanayaka’s first husband died of snake-bite 20 years ago, and her second husband left the family. Her eldest daughter’s husband died in a road accident. Since then, both older women live a hand-to-mouth existence in the small village of Pattini Pedesa near Polonnaruwa, feeding a combined family of five with whatever work they can scrape up. Mrs Dissanayake has a second daughter of 12 years and her other daughter, Mangalika, has two children aged nine and five. Both women try to find labouring work on building sites and roads, arduous work that bring in about Rs.300-400 a day – but even that is seldom available. 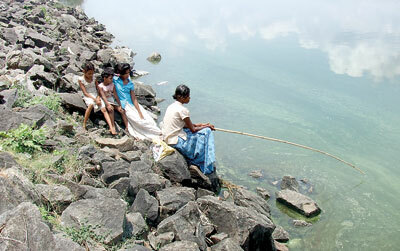 The wide waters of the centuries-old Parakrama Samudra provide the family with much of its daily food, with a few extra little fish to sell sometimes, bringing in about Rs.50 if they are lucky. The family lives in an unfinished little house with no doors, windows or kitchen. The children walk 3km to the nearest school and do their homework on mats spread outside their little home, using the daylight until the sun sets.